CIM Group has started construction of a 154-unit, five-story apartment building, with 16.6k sf of ground floor retail in West Los Angeles. 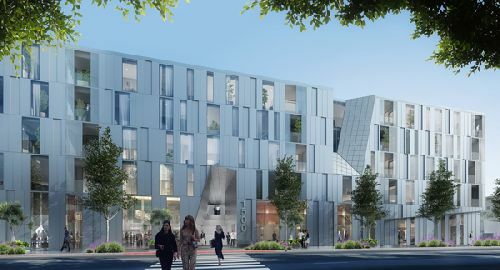 The building, located at 1500 Granville Ave, at the southeast corner with Santa Monica Blvd, marks the final phase of a multi-phased development plan for the 2.6-acre property. The property was formerly occupied by auto dealerships that fronted Santa Monica Blvd, along with three adjacent residential parcels totaling approximately 28k sf. CIM is completing the execution of a program that will bring a total of 338 apartment units, 32 of which are designated as affordable, and a total of approximately 58.3k sf of retail space to this prominent location, with 300 lineal feet of Santa Monica Blvd frontage, one of the region’s major east-west transportation corridors connecting Westside communities such as Santa Monica, Beverly Hills, and West Hollywood. Built above subterranean parking, the building’s modern architecture features an articulated façade with alternating horizontal and vertical elements, providing differentiation from a solid single block design. The street level includes retail storefronts, plazas and landscaping, creating an inviting pedestrian experience. The contemporary apartments are a mix of studio, one-, two- and three-bedroom configurations along with four live/work units. Among the many on-site amenities are a co-working area, community lounge, pool deck, outdoor terraces, barbeques and a gym. In 2016, CIM commenced construction on the adjacent four-story, 147-unit residential and retail building across Granville Avenue at 11800 Santa Monica Boulevard, and it is anticipated to be complete in early 2019. This building also has a modern architectural design with modulated roof heights and façade features. The street level spaces totaling approximately 42,000 square feet are programmed for retailers that will serve the residents and the neighborhood. To date, leases have been executed with Target and Healthy Spot pet store. Apartments range from studios, one- and two-bedroom floorplans to three live/work spaces. Residents will enjoy multiple indoor and outdoor gathering areas including a clubhouse and game room, pool deck, outdoor terraces and lounge as well as a gym and co-working space. An earlier phase of the development brought three smaller, four-story buildings, for a total of 37 apartment homes, on parcels to the south of the two properties fronting Santa Monica Boulevard. These stylish buildings offer one-, two- and three- bedroom residences, and feature a landscaped courtyard and a rooftop lounge with a fireplace and sundeck. These buildings were completed in 2017 and are fully leased.